Great Start to Quality – A great start for every child! Great Start to Quality helps parents find the best early learning settings for their children and helps daycare providers and educators improve the quality of care they give to children. The Great Start to Quality Upper Peninsula (UP) Resource Center serves Alger, Baraga, Chippewa, Delta, Dickinson, Gogebic, Houghton, Iron, Keweenaw, Luce, Mackinac, Marquette, Menominee, Ontonagon, and Schoolcraft counties. Located in Marquette, our Resource Center helps families find child care in the Upper Peninsula and supports providers with improving their program. Great Start to Quality UP Resource Center offers support to Upper Peninsula child care providers and educators to improve the quality of their programs by providing individualized consultation, coaching and access to training and resources. Our Resource Center also supports families in their search for high-quality child care and preschool. If you’re looking for local Head Start and low cost programs, our Resource Center staff can help with your search. Keep track of children’s growth and development to help them learn and reach developmental milestones. The benefits of high-quality child care can be seen in many different areas. High-quality child care helps children be more successful in school, and has shown improved health and increased earning outcomes over children’s lifetimes. Having improved student success, improved health and earning outcomes shows the returns and importance of investing in early childhood. When we invest in high-quality early childhood programs, it helps make sure that we are providing the best opportunities for children to grow and learn. Great Start to Quality measures the quality of early childhood programs and providers in Michigan by using more than 40 program quality indicators aligned with Michigan’s Early Childhood Standards of Quality for Infant and Toddler Programs and Early Childhood Standards of Quality for Prekindergarten. The program quality indicators are standards used to measure the quality of a program in a specific area. Each program quality indicator falls into one of five categories. Staff Qualifications and Professional Development – The training and any education or degrees completed by providers and their staff. Family and Community Partnerships – How programs offer support, and interact with, the families they serve and within the community. Administration and Management – How a program’s policies guide the way they run their program. Environment – The safety of a program and how they support the health and wellness of the children. Curriculum and Instruction – The tools a program uses to teach, accommodate needs and track development of the children in their care. These categories, and their corresponding program quality indicators, are how programs and providers are rated when they complete their Self-Assessment Survey. Each star rating achieved by a program demonstrates a different level of quality. 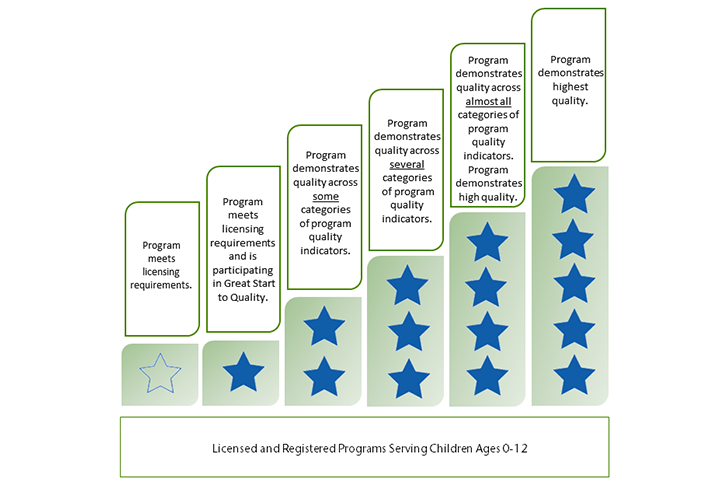 All licensed and registered programs and providers in Michigan have a program profile on Great Start to Quality, where they appear as an Empty Star. If they choose to participate in the Great Start to Quality rating process, they will be rated on a scale of one- to five-stars. We offer a Lending Library which is a free educational resource for you and your children! The Lending Library is designed to encourage and enhance the learning experience at home, school, child care and preschool. To learn more about the Lending Library, visit here. If you are a daycare/ preschool employee and need more professional development, visit here.